Linen King Management Team: (l/r) Gerald Snider, chief engineer; Preston Bringhurst, account manager; Leonard McCullough, founder and CEO; Keith Mateychick, corporate manager; Don Keene, account manager; Gary Hutchison, COO; Jay Betz, president and CFO; L.K. McCullough, founder and VP of operations; Patsy Skaggs, director of account management; Kevin English, director of sales and marketing; Richard Warren, general manager, Conway plant. 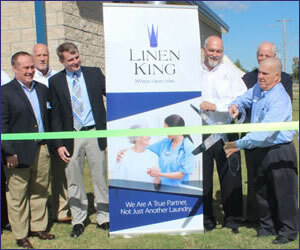 Tulsa, Ok. – Linen King, a Tulsa, OK-based regional provider of healthcare laundry services, formally opened a new 60,000-square-foot plant on Oct. 24 in Conway, AR. The new plant, which represents a $7.2 million investment, is capable of processing up to 30 million lbs. annually. A crowd of about 30 customers, prospects and guests (including a Textile Services Weekly correspondent) gathered in front of the plant for a ceremonial ribbon cutting. A large American flag on a nearby pole snapped in a brisk breeze under sunshine and blue skies as L.K. McCullough, founder and vice president of operations, used a pair of oversized scissors to cut the ribbon. This move signaled the formal opening of the plant, which began processing goods a couple of months ago. The Conway plant is Linen King’s sixth facility. The company’s operations are located across five states including Oklahoma, Arkansas, Missouri, Tennessee and Kansas. Linen King CEO, Leonard McCullough (son of L.K. ), spoke briefly to the visitors following a luncheon served under a white tent, plus a guided tour of the new plant. The laundry includes three tunnel washers from Pellerin Milnor Corp and four ironer lines. Most of the ironers and finishing machinery are provided by Chicago Dryer Co. and G.A. Braun Inc. Adding to the complexity of opening the new facility was the fact that earlier this year, Angelica announced plans to close a plant in Memphis, which is about 2.5 hours’ drive from Conway. That opportunity drew interest from Linen King as a potential buyer. Leonard said Linen King agreed to buy the assets from Angelica because it would help the company grow its business in the Memphis area, while at the same time freeing up capacity in the Conway plant to pursue new business (especially closing OPLs) in the area around Little Rock and southern Arkansas. “So even though it was half crazy to take on that at the same time that we were doing this (the Conway plant), we agreed to go ahead and do it,” Leonard said. “We’re still operating that facility.” Leonard said that over the next couple of months the company will decide their next move regarding the Memphis plant. They’re currently processing about 5.5 million lbs. there annually. If they decide to keep it running, it will get some “polishing” and certification to ensure that the safety and quality standards there are as high as those of the Conway plant, or any other of the company’s other facilities. 1. Hospital consolidation: In most parts of the U.S., larger hospitals are absorbing smaller ones, mainly in a drive to achieve economies of scale and lower costs, including for laundry services. We are also seeing consolidation at the supply chain level as well. 2. Supply chain process: Leonard said some hospitals are so focused on costs they’re “commoditizing” laundry services, a trend that he thinks is penny-wise but pound foolish. 3. Leonard said Linen King is working to differentiate itself as a “valued-added” service provider by having its service team work with hospitals to reduce linen use and waste, thereby saving healthcare providers more than a price-driven approach. “There’s a lot more savings in lowering your overall poundage than there is in being a penny or two a pound cheaper,” he said. Ensuring safety in plant policies and procedures, including Clean Green certification, is another way Linen King seeks to add value to its service.